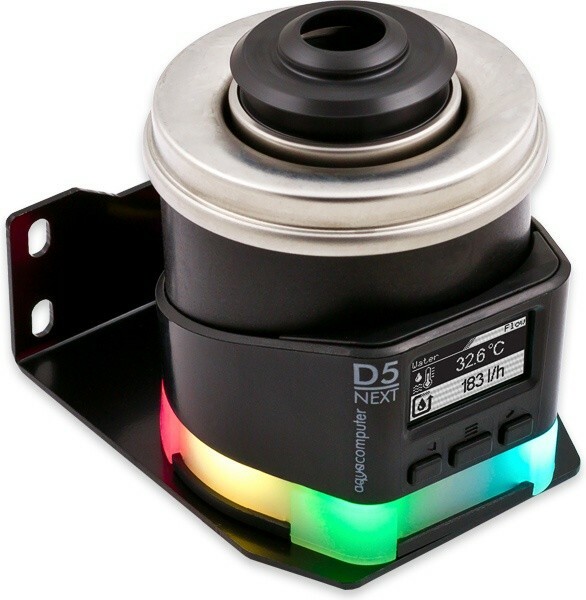 The D5 NEXT made by Aqua Computer is coolant pump with outstanding functionality, based on the renowned Laing D5 pump. 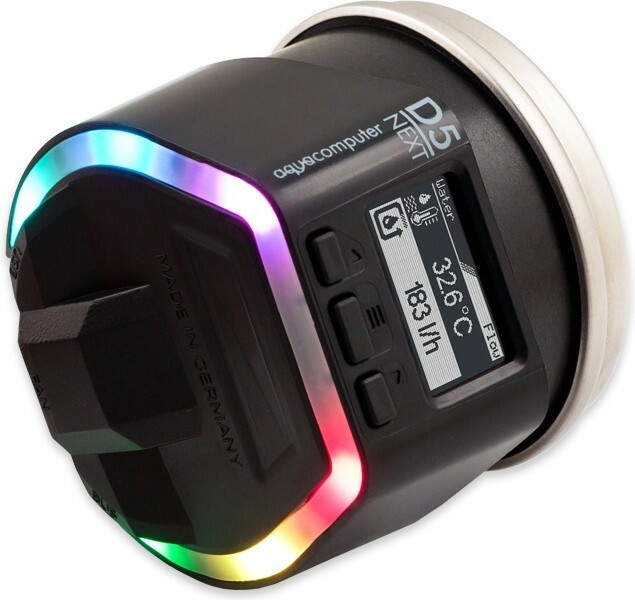 The detachable controller unit is equipped with an OLED display and a powerful fan output. 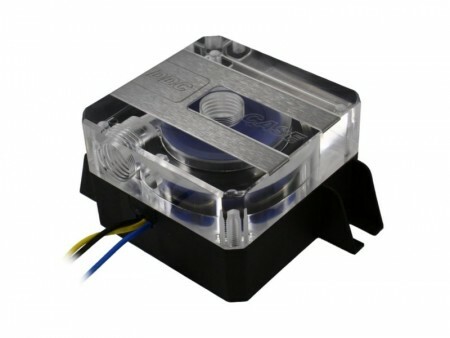 For easy installation, the controller unit can easily be detached from the motor unit. This is immensely convenient for installation - all cables can remain plugged in to the controller unit while the motor unit is being installed into a pump top/cover or reservoir. The high resolution OLED display combined with mechanical buttons underneath and a touch slider on the bottom side allow can be used to configure and adjust the pump without using the PC. As can be expected from an Aqua Computer product, the pump also features an USB interface for convenient configuration and monitoring using the aquasuite software. Additionally, current data such as temperatures, processor usage etc. can be transmitted from the PC to the pump via USB, allowing them to be used for pump control, fan output or RGBpx illumination. 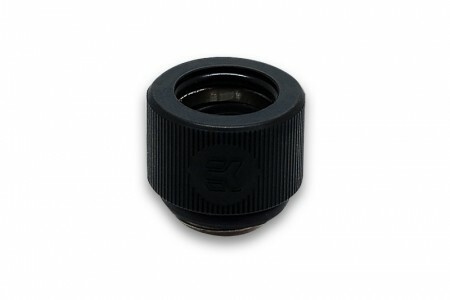 The silicone decoupling included in delivery reduces vibrations to a minimum. A mounting plate inserted into the silicone part can be used for vertical pump installation, an additionally supplied mounting bracket can be used for installation to a vertical surface. If the silicone decoupler is not used, a flat silicone inlay can be installed into the control unit as a replacement. Below the silicone decoupler or silicone inlay, six RGBpx LEDs are integrated into the control unit for effective illumination. By constantly monitoring motor parameters and coolant temperature, a sophisticated algorithm is used by the controller unit to calculated the current coolant flow rate. The accuracy does not match the accuracy of an external flow sensor, but is entirely sufficient for monitoring purposes. 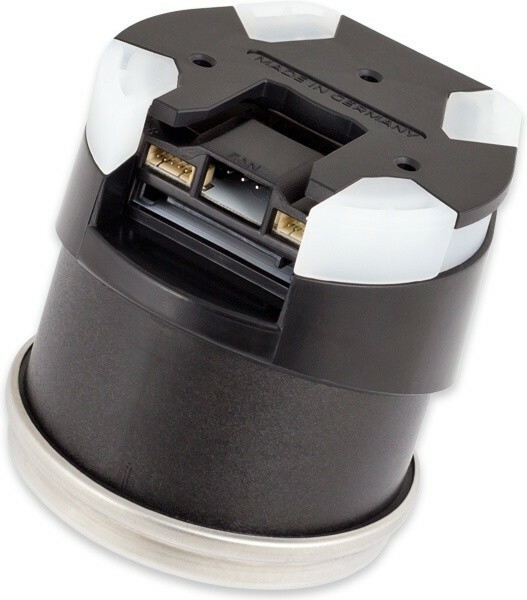 Alternatively, a mechanical flow sensor can be connected to the fan output for a more accurate flow measurement. A temperature sensor directly connected to the stainless steel housing of the pump ensures a very accurate coolant temperature sensing. 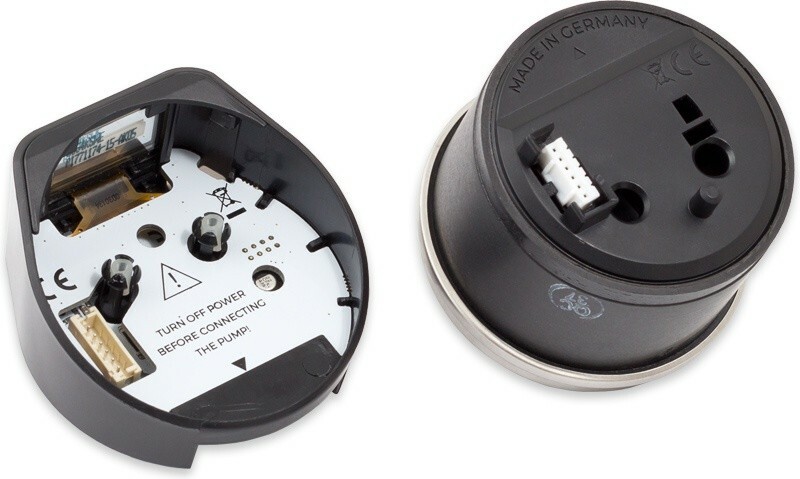 The fan connector of the D5 NEXT can be configured comprehensively, the high maximum power output of 25 watts allows for connecting multiple fans using suitable splitters. In addition to setting fan speed manually, fan speed can also be controlled by temperature. In temperature controlled mode, set point controllers as well as curve controllers are available. If the corresponding temperature falls below the set limit, connected fans can either be switched off or be kept running at an adjustable minimum speed. For secure fan start-up, an intelligent start boost with speed signal monitoring can be configured for each fan channel. In addition to the six RGBpx LEDs integrated into the controller unit, the D5 NEXT is equipped with an RGBpx output for controlling up to 64 addressable LEDs independently. Color and brightness can be individually controlled for each LED. In total, up to four groups of LEDs of varying size can be configured, and visual effects can be assigned to each group. The 23 available effects can be extensively adjusted for further customization. Many effects can also be configured to modify effect parameters (for example speed) depending on current sensor data. The available effects also include sound-to-light effects, visualizing computer sound output. The AMBIENTpx effect deserves special notice, replicating the border area of the current monitor display on connected LEDs, allowing for an impressive background lighting surrounding the monitor. If no RGBpx products are connected to the pump, the RGBpx header can be configured as an aquabus interface. In this configuration, the pump can be connected to an aquaero 5 or aquaero 6 as an aquabus expansion device, giving the aquaero control of pump and fan output settings. 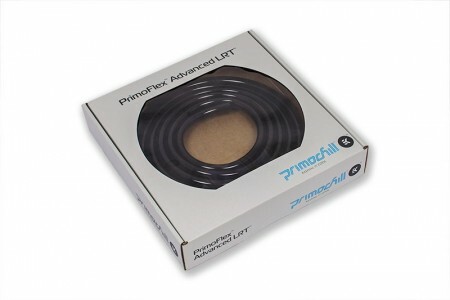 Additionally, coolant temperature and flow rate are transmitted to the connected aquaero. A maximum of two D5 NEXT pumps can be connected to an aquaero simultaneously. 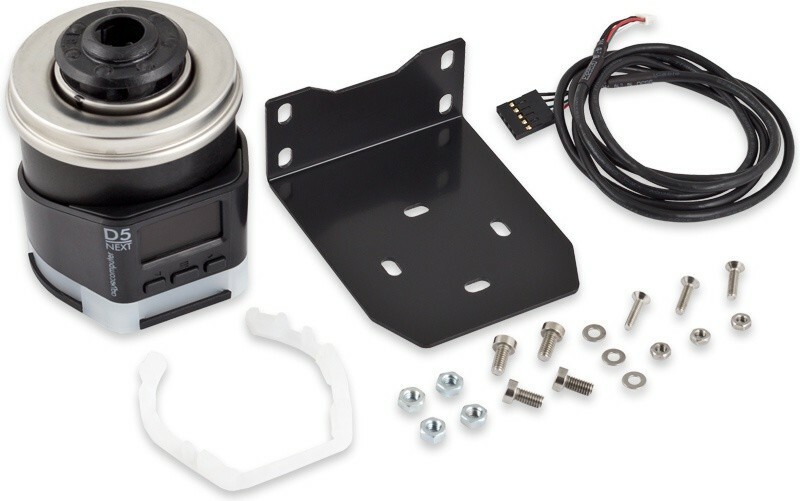 A compatible pump housing/top cover is required for operation, for example Aqua Computer product ULTITOP D5 (41123) or D5 pump adaptor (41094, 41095) or one of the aqualis D5 resevoirs (34079, 34080, 34081, 34082). For installation of the locking ring, the controller unit can be removed from the pump, thereby ensuring compatibility with tops and reservoirs of many manufacturers. For calibration purposes, the pump has to be operated with blocked coolant flow for a short period of time after deaerating the system. Blocking can be achieved by kinking a hose. If hard tubes are used, a ball valve in the coolant circuit is required (not included in delivery). - Simultaneous connection of fan and flow sensor is not possible. - Simultaneous connection of RGBpx products and aquaero 5/6 via aquabus is not possible. 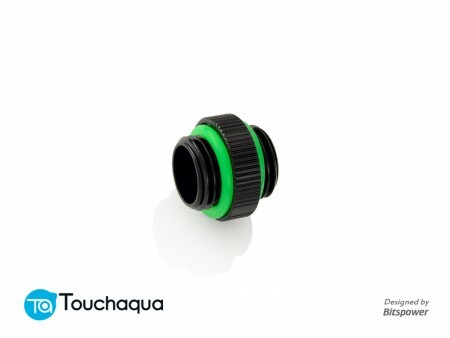 - If the silicone decoupling is used, the touch slider is inaccessible. The pump can still be operated using the mechanical buttons.